I've assembled a number of AR15's without ever running into problems, but I'm a little worried after reading all the threads describing problems. Does anyone have experience with factory assembled uppers or are they just as prone to problems as shooter assembled ones? Any suggestions? Should I just buy a bolt gun and be done with it? Treating all uppers as equal is like saying "I'm in the market for a new car. Does anyone have experience with factory assembled cars?" Some are more problematic than others. Some will have high customer satisfaction and low reliability scores. If you sick to top tier brands, you at least have the peace of mind that if there is a problem, there is a company to turn to for support. If you really want a semi auto, no bolt gun will do. But, you can build, have built, or buy a lot of bolt gun for what you can invest in a semi auto. Without knowing anything more about your desires for the gun, your smithing abilities, or anything about your budget- but with having some experience with the company- I'd say buy a JP and be done with it. What is your motivation in assembling v. buying ? This is an Aero M5 upper/lower. XLR stock, JP Lo Mass HP bolt and SCS. It's a Ballistic Advantage Hanson profile 22" barrel that's amazingly accurate. I was going to buy a JP barrel, but I got a screaming deal on the BA, so thought I would give it a try. It's an easy peasy half inch gun at some pretty good distances. It's an AR gold trigger, SLR gas block, JP handguard, AD Recon mount, Burris XTR II, etc. Good components. That is a sweet rifle. I'm putting together a list of parts for an M5 build and now I want that XLR stock. If you think a bolt gun will fill your needs better, you can get a more accurate one more cheaply, and it will be quieter with a suppressor. I'd recommend the Tikka T3x CTR or Tac A1 if you just want something that runs. Or you can build the AR10, which I can provide a parts list for if you give me a budget OP. 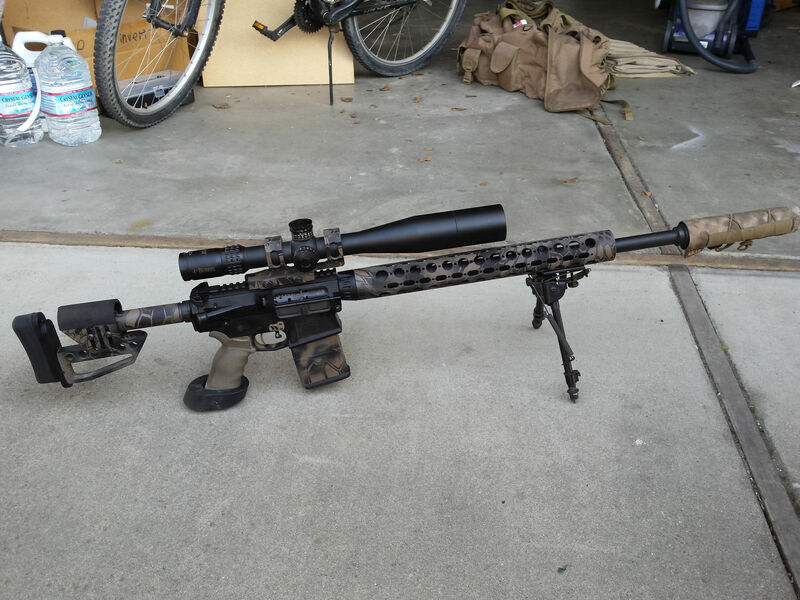 Great build, I recently finished a similar build using the Aero upper and lower, Luth AR rifle stock, I used the Aero H P bolt, B A 22" barrel, Aero hand guard, MBT trigger. Have a few hundred rounds through it and it's completely reliable and much more accurate than I hoped ! You could always try one of the Larue UU Kits in 6.5. I was considering one myself and using one of th new seekins selector gas blocks. My 6.5 Creedmoor is built on an Aero receiver set. I really like that rifle. If you want to build, go for it. Accurate and nice shooting. Adjustable gas and heavy buffer. I have an SLR gas block on mine and a JP Silent Capture Spring. A standard weight AR10 rifle buffer worked as well. The SCS was standard weight, but I just changed it to a heavy configuration (1 tungsten weight and heavy spring). That made it a little smoother. If you go with an XLR stock, you'll need a carbine buffer and spring if you don't go with the Silent Capture Spring. This is the same setup I used in my 6mm Creedmoor as well (Just took it; the 6mm, out for its maiden flight today. Here's my 6.5 Creedmoor. A Saker 762 can is sitting in jail for it right now. One when it had a PRS and another with the XLR it has now. Only other thing that's changed is that it now has a Steiner M5Xi 5-25x56 on it. That Steiner 3-12x50 now lives on the 6mm Creedmoor. If I can provide any info for you let me know. Build is Aero receivers, Rainer 22" Ultramatch barrel w/rifle length gas, JP brake, SLR adjustable gas block, nitride gas tube, Aero melonite BCG, SLR 15" intrepid rail, Atlas bipod, AR Gold trigger, Ambi selector, MIAD grip, XLR stock, JP Silent Capture Spring, LaRue LT745 20 MOA mount, Steiner 5-25x56 Military M5Xi scope. Bottom line, the Aero M5 set is one of the best values out there. Excellent quality at a fair price. Glad to see so many others like their M5s. I'm in the process of building one in 6.5 Creed also. Best of luck man, I'll be watching your progress on here. To all the rest of you, nice rigs! I've only got my lower built with their FDE Betsy Ross edition lower, rifle tube and JP SCS heavy, Magpul PRS stock, Aeros no fcg lol, and Timneys Calvin Elite AR trigger which I'm reluctant to keep after just trying it my SBR lol. Hell I was reluctant to order it after virtually NO info was out there on anybody that actually had one. I agree, Aero is fine and a good value. I was a little apprehensive when I purchased my first receiver set. When it came in I was pleasantly surprised. The fit and finish were nice and it went together with no issue. Been a great shooter. I was originally going to order a Krieger barrel for mine, but the wait time was long. Coupled with whether I would like the 6.5mm or not, I went with the Rainer Ultramatch barrel. Wasn't cheap, a little over $500 back then. It has been a great barrel. I've been far more than pleased with it. The Wilson Combat Match I used on my Second Aero set (another case of "I may not like the 6mm..") was a little less, but the barrel has been great as well.